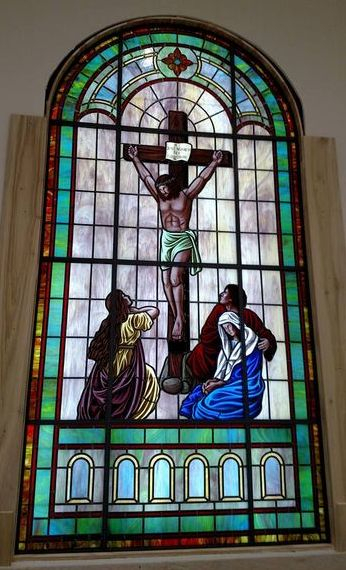 Laws Stained Glass Studios has worked with Benton Heights Presbyterian Church in Monroe, NC on numerous occasions. In 1971, Laws provided (10) opalescent glass windows for the sanctuary. Six of the windows had 20" x 36" medallions with scenes from the "Life of Christ" series. 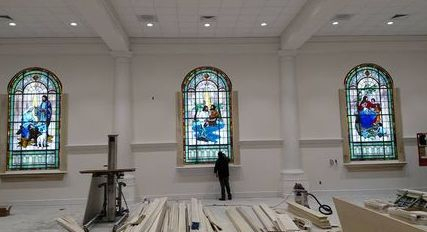 In the late 1990s, Benton Height Presbyterian Church built a family life center at a new location, and they left these windows in place at their old location. In 1999, Laws provided a hand-stained pictorial window (10 feet wide x 18" feet high) for their new family life center. This window depicted Jesus ascending to heaven with his disciples below him. Along with the window, Laws installed a new dark bronze aluminum frame and 1/4" Lucite on the exterior as the protective covering. In 2015, Benton Heights Presbyterian Church renovated their family life center to look more like a traditional sanctuary. 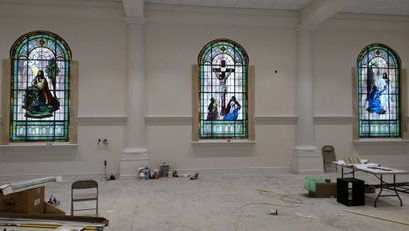 In addition to a new ceiling, walls, and pulpit area, they installed (6) large stained glass windows. Since these windows were interior with no sunlight, light boxes were made by Laws to light the windows. The lights used are LED lights. These windows are 72" wide by 138" high and are made of leaded, opalescent glass and hand-stained pictorial floating scenes. The scenes depict "the Nativity", "the Baptism", "Blessing the Little Children", "Garden of Gethsemane", "the Crucifixion", and "the Resurrection". All of the windows made in 1999 and 2015 were designed by Vincent Ketchie and painted by Laws' artist Nina Haynes.